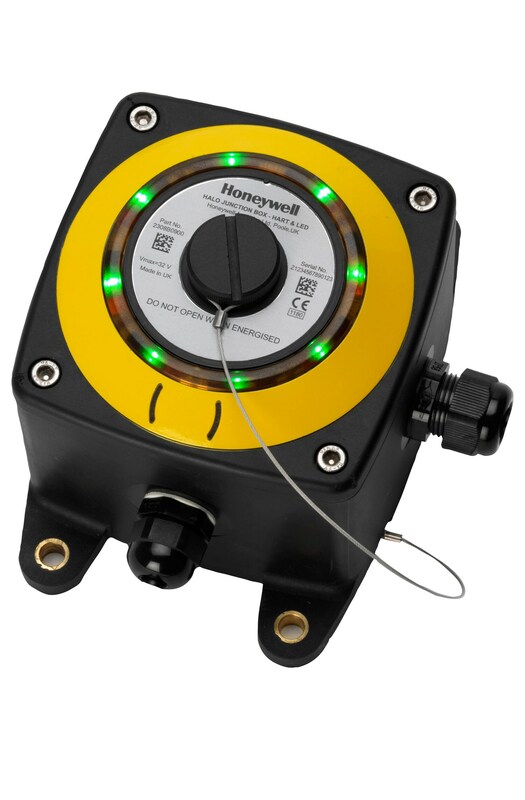 The HALO Junction Box enhances the Searchpoint Optima Plus point infrared Hydrocarbon gas detector* by providing a local display showing the sensor status at a glance, even from a distance. It also gives convenient, non-intrusive interaction with a HART® handheld device through an optional intrinsically safe (IS) HART® connection point. HALO uses three instantly recognisable ‘traffic light’ colours to indicate its status. The LED light ring shows green to indicate normal operation, yellow to indicate a fault / inhibit and flashes red to indicate an alarm. This allows anyone in the area to clearly and immediately see the status of any detector. This can be particularly useful to identify operational status if the detector is located in a difficult to access area. HALO is an ATEX / IECEx certified Ex e junction box for use with Searchpoint Optima Plus. It provides a local visual status indication, and an optional intrinsically safe non-intrusive HART® handheld device interface, for sensors that support HART® communication. It is suitable for use in either Zone 1 (gas) or Zone 21 (dust) hazardous areas. HALO has three M20 cable entries and one M25 sensor entry. Internally, the box has a continuity plate with two earth connection points, and a 12-way terminal block. The box lid has a three colour light ring (green, yellow and red), and optional connections for a HART® handheld device.